Ask fellow campers about "Hidden Paradise Campground" and nearby attractions. Sites where we were are close together, but other areas appeared to have more room between them. Sites have barbecues but no tables. We camped at Hidden Paradise Campground in a Motorhome. We stayed here on a holiday weekend so it was pretty full. THis campground does not have full hookups so have to take the value down slightly. Overall we had a nice time at this campground. Driving into the park seems a little daunting with a big rig but once past the office it was fine. Thye have a nice quarry for swimming and the river can be floated on kayacks or tubes. Wifi did not work and Cell service was marginal. We were able to get Satellite on site C2. We would return here again. We camped at Hidden Paradise Campground in a Motorhome. Overall very good stay. Staff was very helpful but seemed overwhelmed at times due to it being very busy. Strange layout for a GG. You need to be pretty good at maneuvering your rig for some spots. All roads were gravel and smooth. No paved spaces. A good portion of the roads are through wooded sections where some small branches will contact your rig. Be sure you have at least 30 feet of power cord and water hose available. Many sites have a single pole with 4 water and 4 elect connections in the center with four campers parked in a square around the utility pod. Not many 50 amp spaces avail. I think about half the spots were seasonal rigs that never move. It seems that 95% of the sites were families with kids but from what we observed people were friendly and just there to enjoy the outdoors, hang out with friends and swim in the quarry. Several families had dogs but all were leashed and everyone seemed to pick up after themselves. No trash cans. You must take bagged trash to dumpsters. This seems like a pain but it there weren't a bunch of bees and no overflowing trashcans with keeps the place looking nice. Overall a very good weekend. Reservations are a must. Oh, not CG fault but be aware that AT&T cellphone coverage is extremely week. We camped at Hidden Paradise Campground in a Motorhome. We were at Hidden Paradise to scuba dive. The quarry isn't known to be a good dive spot as visibility is usually poor (4-5'). We were there checking out equipment and practicing for an upcoming vacation. The campground had: WiFi (not working), dump, laundry, grocery, LP bottles, fire rings, firewood and river sites. Nice woman greeted us after hours. There was a trashy trailer upon entrance. We were upgraded to a riverfront site at no extra charge. As we drove to our site there were several campers grouped together and kept running a siren. With that said, we were very pleased with our campsite on the river - best atmosphere of any campground where we have stayed. We spent one night but wanted to stay longer. Little town was very quaint. We would stay there again. We camped at Hidden Paradise Campground in a Fifth Wheel. Get ready to get nickel and dimed to death. Everything is an additional charge. You have one extra adult, that's an extra $14. You want to swim in the campground's rock quarry, that will cost you $7 per person. You want to bring your golf cart into the campground, that will cost you $10. See what I mean, it adds up very quick, and your $30 a night site turns into a $50+ a night site, and this campground isn't worth $50 a night. Staff isn't overly friendly, and it's hard to tell who works there, because no one wears anything to identify that they are staff. The water has a smell and is tinted a light brown, our hose is stained from the weekend stay there. They don't have the sites marked with gravel or concrete, just grass, and everyone just sets up wherever they want. Most sites don't have sewer. 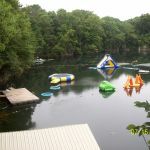 Rock quarry is nice and clean, and the kids enjoyed the inflatables. The crowd that frequents the campground is a little rough. Bring your wallet cause your going to need it. Everything is extra. We camped at Hidden Paradise Campground in a Travel Trailer. 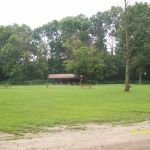 The park is huge with nice graveled roads to ride your bike on, a very large field in the center of the campground where there were campers and we played frisbee in the sun and watched stars at night. My only hang up was that there was a cost for swimming. The convenience store on site is nice, but it's better to make sure you have all your supplies, or stop at Wal Mart on your way in. They have WiFi, but it wasn't very good. I did have good Verizon reception though. We camped at Hidden Paradise Campground in a Travel Trailer. We stayed for one night. We were in a pull-through site near the shower house. It appeared that at a busy time, three rigs would be lined up end-to-end in this section, a strange arrangement. The majority of the sites appeared to be seasonal. Showers were not good: water trickled out of the shower head and it smelled rather like sulfur. It was okay for one night, but we would not return. We camped at Hidden Paradise Campground in a Motorhome. OK campground but layout was strange. Staff very friendly. Our site had, P/T W/E, hook ups on door side of trailer. No cable available and dish set up looked to be iffy. Also, looked like you could put three units in a row, one behind the other, very strange. Narrow road to get into campground, but not a real problem. Stayed one night - would stay again. Rate was a GS. We camped at Hidden Paradise Campground in a Fifth Wheel. This was our very first camping trip, in our very first travel trailer. Chose the park because of the proximity to another commitment during the weekend. The place really is a nice piece of property, and the sites are pretty big, given that you park parallel to the river on a river-front site, which means you'll get to know your neighbors, regardless. New shower house is nice, but isn't kept particularly clean. It's a dog-friendly place (we have three), and we met lots of nice folks, including the staff, who were polite and helpful. Biggest complaint is seasonal campers/campsites- some of them, including a couple along the 'premium' river-front sites, should be hauled off and burned- flat tires, rusty siding, and no inhabitants. Plus, there are a couple mobile homes in the entrance road (it's also the exit road...be careful pulling out in the 'blind left' turn) that make the place seem a bit like a mobile home park at first impression, rather than an RV park. We're going camping for scenery and serenity, and for a weekend getaway, it's fine, but we'll investigate all the other options within a couple hours of our house before we would go back here. We camped at Hidden Paradise Campground in a Travel Trailer. Great Park for the kids... The quarry is amazing. Nice people who run the place. Pretty clean. We would definitely camp here again if we are in the area. We camped at Hidden Paradise Campground in a Travel Trailer. Really pretty park. We stayed here two nights in a 31' Airstream, in the pull-through "Lily Pad" area. Plenty of room to turn around and was not crowded at all. Management was friendly and easy to deal with. No noise or hassles. I'm not sure they have pull-through full hookup sites: none were available when we stayed, only water/electric. But they have a dump station, so for 1-3 nights it was no huge problem. Would definitely camp here again. We camped at Hidden Paradise Campground in a Travel Trailer. The Garmin had us go through town and we found the small town streets a bit difficult to maneuver. The campground interior roads are gravel and well maintained, restrooms were clean as were the showers. My wife and grand daughter had a large spider encounter and refused to use the facilities. Playground was modern with a dusty sand base. Utilities all worked fine. We camped at Hidden Paradise Campground in a Travel Trailer. We enjoyed our stay here. There are shaded sites and the swimming area in the quarry was a lot of fun. We also rented a canoe for a trip. A nice family campground. We camped at Hidden Paradise Campground in a Fifth Wheel. We stayed at this campground late this summer. The campground was pretty but the ownership left a lot to be desired. We paid a month's rent and were told to park in the temporary lot until a full hookup space became available. The couple that moved in a few days after us were offered the first available full hookup spot without a word to us. The lady in the office refused to even talk to me about it and acted like I was unreasonable to even bring it up. So, after paying for a full month for full hookups at the end of four weeks I asked about refunding part of our money. The owner said, "It's the same price for no hookups." I felt we were lied to and ripped off. Beware of when you park in the temporary parking, they kept putting people in the spot under the black walnut tree. We camped at Hidden Paradise Campground in a Travel Trailer. 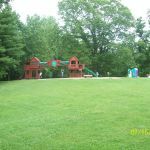 We decided to stay here on a weekend with my sons because of the water park that is part of the campground for an extra fee, which is listed on the site. The campground was easy to find and signs were up to guide you from the highway to the driveway. Upon arrival the lady working was very friendly and got us checked in quickly. The shop has some snacks and basic needs kind of things as well as life jackets if you choose to use them at the water park. The roads were gravel and in good shape for gravel. Our site was a river view site, which my sons enjoyed, that did not have a sewer hook up. The tote pull to the dump station is a little ways and with the gravel it was rough but not bad. The dump station was well maintained and functioned perfectly. We had some noisy neighbors across the field, which I had to approach and ask to calm down at nearly 2 AM, but they were gone the next night and it was very peaceful. Overall, the fees were not bad and my sons had a great time so we will be returning. We camped at Hidden Paradise Campground in a Tent Trailer. Are you affiliated with Hidden Paradise Campground ?